How Clean Is Your Ocean? 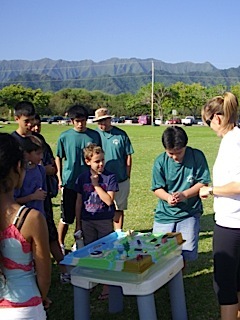 Learning from the watershed model how land-based activities affect our oceans. Water Quality Snapshot Days with Hui o Koʻolaupoko (HOK) are an easy way to help monitor the quality of Hawaiʻi’s oceans, streams, and other water sources. As a volunteer on Snapshot Day, you’ll learn how to sample the water for temperature, turbidity, salinity, dissolved oxygen, pH, and enterococcus bacteria. To see the results of HOK’s first 2010 Snapshot Day—February 6 at Kualoa Beach Park, Kaneʻohe Bay, Oʻahu—go to http://huihawaii.org/data.html. Recording data from tests of water samples. Volunteers are invited to participate in the next Snapshot Day on March 6, 9am-11am, at Heʻeia State Park in Kaneʻohe. For more details, visit www.huihawaii.org or call Community Coordinator, Kristen Nalani Mailheau, at (808) 381-7202. HOK would like to thank all the volunteers who participated in the February event, Hawaiʻi Pacific University for the use of the YSI 85, and Surfrider Foundation Oʻahu Chapter for the use of the Idexx machine to process enterococcus samples. HOK consistently seeks funds (private, state and federal) to continue monitoring water quality and works closely with the State of Hawaiʻi.